Warning: All persons using the North and South Canol roads should be warned that these roads are never snowploughed in the winter. They are allowed to snow shut in the fall, and thaw in the spring. These roads should not be traveled between the end of September and mid-May. There are also no services along these routes, other than what is available in Faro, Johnson's Crossing and Ross River. You must bring everything you need, as these are true wilderness areas. The 513-mile-/825-km-long Canol Road (Yukon Highway 6) was built to provide access to oil fields at Norman Wells, NWT, on the Mackenzie River. Conceived by the U.S. War Dept. during WWII, the Canol (Canadian Oil) Road and a 4-inch-diameter pipeline were constructed from Norman Wells, NWT, through Macmillan Pass, past Ross River, to Johnson’s Crossing on the Alaska Highway. From there the pipeline carried oil to a refinery at Whitehorse. Only about 1 million barrels of oil were pumped to Whitehorse before the war ended in 1945 and the Canol Project was abandoned. The Canol Road was declared a National Historic Site in 1990. The Canol Road between Johnson’s Crossing on the Alaska Highway and Ross River on the Campbell Highway (South Canol Road) and between Ross River and the YT–NWT border ( North Canol Road) is open to summer traffic. It is maintained to minimum standards. Services are available only at Johnson’s Crossing and Ross River. Road conditions: Maintained to minimum standards. Narrow, winding road; 1-lane bridges; road surface slippery when wet; steep hills; blind corners. Not recommended for large RVs or trailers. Not recommended for any size vehicle in wet weather. Drive with headlights on at all times. Attractions: Fishing; camping; hiking the Canol Heritage Trail. The Canol (short for Canadian Oil) was a project that built a pipeline and a road from Norman Wells, Northwest Territories to Whitehorse, Yukon during World War II. The pipeline no longer exists, but the 232 kilometre-long Yukon portion of the road is maintained by the Yukon Government during summer months. The Canol Road starts at Johnson's Crossing on the Alaska Highway near the Teslin River bridge, 126 kilometres east of Whitehorse, Yukon and runs to the to the Northwest Territories border. The highway joins the Robert Campbell Highway near Ross River, Yukon, where there is a cable ferry across the Pelly River, and an old footbridge, still in use, that once supported the pipeline. Construction and development of the Alaska Highway and airfields along the Northwest Staging Route and provision of military bases in Alaska led to a determination that a source of fuel was required. High-grade oil was available at Norman Wells, and the scheme was to construct a pipeline to Whitehorse. Assorted components, including pieces from Texas, were moved to Whitehorse to construct a refinery. A road was built to provide access to build and service the pipeline. At first, the effort was to move all construction activity for the pipeline and road to Norman Wells from northeastern Alberta. This required the use of winter roads and river movement, including several portages around rapids, and was soon found to be cumbersome, slow and a bottleneck. Ultimately, construction proceeded both from "Canol Camp" (across the river from Norman Wells) and Whitehorse, and the roadway was joined in the vicinity of the MacMillan Pass, on the Yukon-Northwest Territories border, in the winter of 1942-1943. The four-inch pipeline was laid directly on the ground, and the high grade of the oil allowed it to flow even at -80 Fahrenheit. Workers on the road and pipeline had to endure mosquitoes, black flies, extreme cold and other difficult conditions. The poster for the company that hired workers warned that the conditions could be life-threatening, and if people were not willing to endure the conditions, to not apply for the work. The oil flow commenced in 1944, but was shut down in 1945, having not performed entirely satisfactorily. Some supplementary pipelines were installed to distribute product from the Whitehorse refinery, which also closed in 1945. Some of the supplementary lines remained active into the 1990s, although the line to Skagway, Alaska had its flow reversed, and it was used by the White Pass and Yukon Route railway to move petroleum products into the Yukon. The primary pipeline between Whitehorse and Canol was later removed and sold for use elsewhere. The refinery was purchased in early 1948 by Imperial Oil and dismantled, trucked to Alberta for the Leduc oil strike. The roadway is the surviving legacy of the Canol project. Although abandoned in 1946-1947, the southernmost 150 miles was reopened in 1958 to connect Ross River, Yukon with the Alaska Highway. A molybdenum mine briefly operated along this part of the route in the late 1950s. The next 130 miles from Ross River to the Northwest Territories border was reopened in 1972, and soon after, mining exploration companies used the route to reach into the N.W.T., including the use of washed-out, bridgeless roadway to scout for minerals, although none beyond the border have been developed. A barite mine has operated near the north end of the Yukon section. Until the late 1980s, it was still possible for automobiles to reach some 15 miles into the N.W.T., up to the second crossing of the Tsichu River. At the first crossing of that river, vehicles had to ford the river, since the wooden bridge from 1943 had long since collapsed. Since a washout around the MacMillan Pass, only the Yukon side is passable, as it was repaired by the Yukon government. The prospect of the N.W.T. portion being repaired for automobile use is poor, as it is an extremely difficult route in sections. If the demand existed for a road between Ross River and the Sahtu region, it would make more sense to build along an entirely new route that was actually recommended in 1942 by the First Nations member who was called upon to locate a route. Such a route would emerge from the mountains opposite Tulita, Northwest Territories. The Yukon section of the road is little changed from 1945, although culverts have replaced some of the original one-lane bridges, and several one-lane Bailey bridges remain. There are very few two-lane bridges on the road. Many are marked with a sign indicating not to use at temperatures well below -20 Celsius, seemingly redundant since the road is closed in winter, when such temperatures would happen. 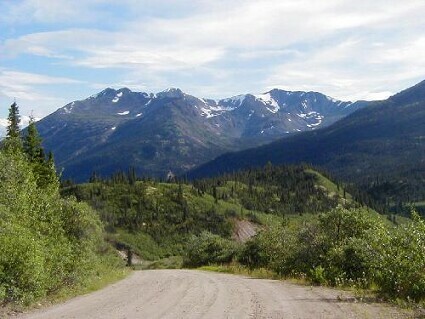 It is a winding, hilly road, resembling the original Alaska Highway that has been substantially upgraded; the road is not recommended for RVs, and traffic is very light. Occasionally, the road's alignment is reinforced with signs using the symbol for winding road. There are few guardrails, and other than a government campground, no facilities except at Ross River. Former Yukon Member of Parliament Erik Nielsen, Q.C., P.C., owned a cabin for a retreat at Quiet Lake, and at party meetings, some people showed up with signs identifying themselves as delegates for Quiet Lake. Quiet Lake was the location of a small boat used by military officers for recreation during the war; that boat is now at the Transportation Museum in Whitehorse. Adventurers have hiked or biked the 225 miles of Canol Road from the pass as far as the Mackenzie River, reporting spectacular scenery, relics of the Canol project (abandoned trucks, wannigans and cabins), and no bridges. A group of cyclists took nine days to travel from Canol Camp to Ross River, a distance of some 355 miles, but just a day from there to Whitehorse (230 miles). There are no plans by the N.W.T. government to restore its portion of the road, which does not have status as a highway, being impassable to ordinary automobiles or trucks. It has been designated as the Canol Heritage Trail, and forms a part of the Trans-Canada Trail.